This was a in house game jam in the studio, due to the success and benefits from entering the Cambridge Game Jam I kept pressuring the tutors to either find and enter us into a new one through the course or host an in house one potentially over the holidays, which would be optional but beneficial to students if they attended. We decided on Plants, and the idea behind the game was that you are a plant in a farmers field/maze and you have to collect water and sunlight to stay alive. By going around the maze to collect randomly spawning water you would gain speed, without water you would eventually slow down and die. Also in the maze was enemies of plants which patrolled areas of the maze in the form of an ant and a spider if they caught you it was game over, but you had a limited ability to fire a razor leaf at them which stunned them for 5 seconds so you could get away. Also the maze changed as you played so suddenly you could be caught in a dead end without prior notice of change. My role in this game was design of the main character the plant, razor leaf model and blueprints (projectile), navigation mesh of the maze for the AI, AI tracking of the player in blueprints and the logo design. I also worked alongside Mark in trying to figure out animation for my character and his enemy characters. The main focus was on the design and texturing of the character as this was only a 24 hour game jam, then animation also took some time. Once they was out of the way getting the AI to work was my priority with building the nav mesh so that one enemy had one half of the maze and the other patrolled the rest, the varied difficulty of the maze depended on which section you was in due to the upped speed of the ant so you needed alot of water and quick reactions to collect water in that area. As a final extra touch due to time left over I added a projectile system to our main character which allowed the player on pressing space bar to use a razor leaf ability to disable the enemy for a temporary time on a delay node of 5 seconds. This is for the razor leaf projectile which disables the enemy characters for a set delay, and then the movement of the AI characters around the area tracking the player character to try end the game. Unfortunately we completely overlooked the HUD/UI features for the game and this cost us in the marking, we did have a sort of display of points by using blueprints print strings but this isn’t a proper working HUD/UI. The menu system was implemented using my logo design as the background and a simple “Start Game” so the game did have a navigation system. I used a contrast of green for plants to simulate life in the plant then black for trap and the spider to symbolise death. The simplicity of the logo in colour scheme gives it a nice professional flat look to it, I didn’t try to over do anything it was simple silhouettes of the characters then a type that I felt suited the game bold but also edgy. I used the L to balance the plant on due to it looking like a solid unit you would place a plant on, then the spider suspended down from the loop in the A seemed to suit nicely for layout. If you choose to read further into it the semiotics behind the plant in higher position is to show authority over the spider as you are the main character, but also the spider despite being lower and therefore inferior being black in a poised position to pounce its not to be under estimated as it can bring death upon you. Overall I am pleased with the final product from the Plant Trap game, some features that we designed such as models for power-ups and bad pick-ups such as seed fertilizer for growth, and then toxic pollution to damage the plant didn’t get implemented but they are there if the game was to be progressed upon. My disappointment would be that we forgot to implement a HUD system which evidently cost us in the end. My own personal contributions to the project I felt that I was a key member of the team that had involvement in all aspects of the project, including leadership which was sort of collaborative dependent on the situation but an overall id say I called a few decisions in the project and tasked people with work once they had completed a previous task. Categories: Year 2 | Tags: 3D, 3D Model, Adobe Photoshop, art, Brief, Design, Design Process, Drawing, Environment, Event, Game Jam, Gameplay, Games, ideas., Logo, Models, progress, Project, research, texture, Video game | Permalink. In July last year I entered my first official Game jam, this was run by JAGEX at their studios in Cambridge. We entered as a course and took 6 members and our tutor with us to form a team (Paul observed and graded). With this being right after the end of first year it was great practice to keep the ball rolling with work and improving all the time, the most valuable part of it was being part of a mixed team with 2nd years this allowed us to work with people who was further along in the course to try bring us up to speed for this 48 hour straight game jam. These were the main features we could come up with and eventually we settled on a slight incorporation of a few of them. We pinned down a cyclist who is in a dream and he has the power to change the day night cycle to solve puzzles and piece together his bicycle. So it was a puzzle 2.5D side scrolling game we decided to go with to support this and it was fairly basic to do in a shorter space of time, showing we didn’t punch above our weight implying we would do a fully immersive 3D environment with multiplayer online time trials. My role in the project initially was alongside Phil to sketch up some level designs, so plan out issues that the player would come across forcing them to go back or use the power to change the day/night cycle. We decided that a journey from city to countryside so sort of a race in his dreams to the start line of the race, settings would go from city to park to village to countryside (hills) to start line. This was obviously ambitious to have 5 environments in the final project but at least we had considered how the game could have gone forward with extra time. Then after level design I worked on hand painted texturing of the level, my limited skill in texturing at the time Paul suggested I used Mudbox’s projection painting. This proved very quick and useful granted it wasn’t all perfect when it came to bricks but with the time length of the project the visuals was still impressive. I then used this to projection paint graffiti onto a bus for the city level, I did this using many iconic game characters and general graffiti (even had Banksy art on the bus). Then I modeled a taxi (this first ever car I had done) which I was very pleased with at the time for the quality of my 3D and it actually made me pursue automotive modelling throughout the summer. Alongside general texturing of other peoples models and doing little assets myself I then took it upon myself to think or a name and design the logo. This shows my work in level design, hand painted texturing and models. Admittedly a quick logo at best but you can see the idea behind it with the “cyc” making a bicycle, with more time alot of this would have been alot further along, some models didn’t make it in but nothing is wasted as if we was to progress this idea at any point we have put in the work through a design process to easily expand on what we have. To evaluate the game jam overall it was a very worthwhile experience for myself, it allowed me chance to work in a team to push along together with a 48 hour deadline, which testing teamwork, communication and overall commitment to stay awake and work. 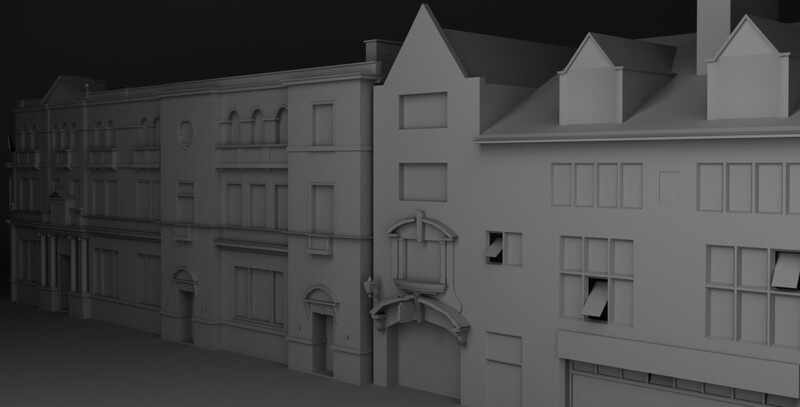 I have taken alot away from this game jam in relation to how my 2nd year has gone, I view it as the starting point of my 2nd year to push on, after I began work on my personal classic mini project due to enjoying the modeling of the taxi. One thing I have reigned in is the graffiti, granted projection painting was very enjoyable and produced decent results but graffiti took over my game jam i remember doing it on a coke can just because I could, should the opportunity ever arise in a project requiring graffiti you can be sure I have it covered though. Despite not winning on this case the JAGEX judges was impressed with our work and the visuals of the project. Most of the other teams was programmers which we didnt have any we are all artists so naturally our game would look better but maybe not play as well, but personally I think what we produced with the issues James had with Kizmit on his own was a great achievement. Maybe a programmer would be advisable next time but now our knowledge in blueprints is more that enough for a Game Jam so we should in future have a visually and interactive game, to hopefully win with. Categories: Year 2 | Tags: 3D, 3D Model, Adobe Photoshop, art, Brief, Client, Competition, Design, Design Process, Drawing, Environment, Event, Game Jam, Gameplay, Games, Group, ideas., Logo, Models, PHASEgaming, progress, Project, research, Shading, Team, texture | Permalink. Last session we had to present our self initiated idea to the rest of the group, after getting the green light for my project i really have gone full speed into researching my field starting in need for speed and gran turismo. These games have helped me outline the foundations of where i want to go with my game visually, the main aspects i have looked at are: The HUD/GUI, the racing features (blur, impact etc. ), menu system, garage feature and gameplay elements. From my research i am hoping to draw up some designs for my ideas shortly whilst i begin game mechanics in Unreal Engine 4. With it being a drag racing game the main game mechanic i need is the manual gearbox so that will be the first thing i tackle shortly using a basic preset racing engine save file so i can test as currently i have nothing to drive unless i rig my mini or mustang shortly. My presentation went down really well i felt, i delivered a clear idea to what i want to achieve and where i will be going about my game aswell as giving everyone a taste of what the game is about. After i presentated it was open to the floor for any feedback or critique on my work and where im going with it. The wasnt any critique they all seemed to like the project, it was just suggestions. David suggested i do some sort of in game soundtrack which was a tickbox of ideas i already had time permitted, and james asked if i was going to do class systems for the cars as id already mentioned a wide range which i took on board as a possibility. Then Dave Eccles the illustration tutor asked me my reasoning behind my type choice in the logo. I said from all the types i went through it was the one that screamed out to me car, as it reminded me of the sort of type used for muscle cars like a mustang mainly american cars really. He accepted that at the time until later on when i asked him for guidance on the type. It was clear that the type was drawing the attention away from the modern looking logo id designed to a rather older time like 1960s/70s according to Dave, i could see where he was coming from and asked for his help to take it to the next step. He loved what id done with the heartbeat monitor style id gone for and wanted to work with me on making it and i quote “something that teenagers will remember and scream wow this is awesome when it comes on”. From this idea we came up with it being on a car grill as maybe a badge or actually shaped in the grill, this i could use as a texture for one of the cars and go a awesome ident where the car is speeding in to a stop on the camera fading out to the logo. This all sounded so promising and Dave took my current file of just the logo not the type off me to work on an idea that i will be able to play with if nessacery later on. i will post the results when i have them. So initally i had a filled car to try made it bold and popped out but when i tried a variation with just the outline it looked alot sleeker and modern so i stuck with it. As you can see i could have many a different car with this logo as it works with all as a basic silouhuette and couild be fun for the player to try identify what it is. i like the mclaren p1 silouhuette personally but the final product with the lamborghini is just as good and modern looking for what i was trying to design. Now im working with Dave Eccles to take it to the next step and look forward to producing some good results. Back to the presentations, to show my professionalism whilst it wasnt me in the limelight i took notes on peoples presentations so that i could propose suggestions or ask questions about it at the end. I did this for every student where possible generally coming up with other games that had similar styles or ideas that they were going for with their work. For example steve was doing a blob that escaped from a factory into the jungle and he took over enemies by jumping on them, this to me had reference to oddworld: abes oddysey where abe escaped rupture farms to gain power to go back and free his fellow race, one of them powers was the ability to take over and control the sligs without damaging himself. I could elaborate on feedback i gave to each individual but the tutor was present so im sure he knows what i said to the other students. Now its time to get to work on the Car Beat project ill keep everyone up to date. Categories: Self initiated, Year 2 | Tags: Adobe Photoshop, Car, CarBeat, Design, Design Process, Logo, PHASEgaming, progress, Project, research, Self-Initiated, Video game | Permalink. Previous work: blog 1, blog 2, blog 3, blog 4, blog 5, blog 6. After storyboarding the idea behind the ident and then creating my tank in photoshop in both normal and rusted textures i moved myself into Adobe After Effects a program which will allow me to create and edit my video using multiple methods of editing. I imported a background that i found into the project and dragged it into the composition, i also imported the rest of my files which included the ident and both tanks. As i didnt want the ident and the rusty tank to show up until near the end i used the opacity setting to turn them to invisible until called in with a keyframe later on. First i wanted the normal tank off stage and to slowly chug on across the plain, then to have a little judder and slowly grind to a halt, this is when the tank will fade into rusty tank. Rusty tank stays stagnant until background fades out then the ident cross fades with rusty tank to finish my ident. This was a slight alteration to my storyboard as i wasnted a rotating 3d camera around the tank but i couldnt get the hang of it and it required many different photoshopped versions of the tank from different angles as the original was 2d. Also the smoke from the tank i didnt implement purely down to wanted to crack the basics, i would have also liked the treads of the tank turning to simulate movement and not sliding. These are all factors to improve on and with more practice in after effects im sure i could improve vastly on my ident. Categories: Creative Futures | Tags: Adobe Photoshop, after effects, Brand, Design, Design Process, ident, Identities, Logo, PHASEgaming, rusty tank | Permalink. Previous work: blog 1, blog 2, blog 3, blog 4, blog 5. Moving on from last design process of designs for the idents and then moving them into Photoshop, i proceeded onto the next part of the brief which was story boarding my ident idea in thumbnail form. Despite deciding to move on from Black Rose and choose Rusty Tank i still wanted to do a storyboard as it could be used in a future project. 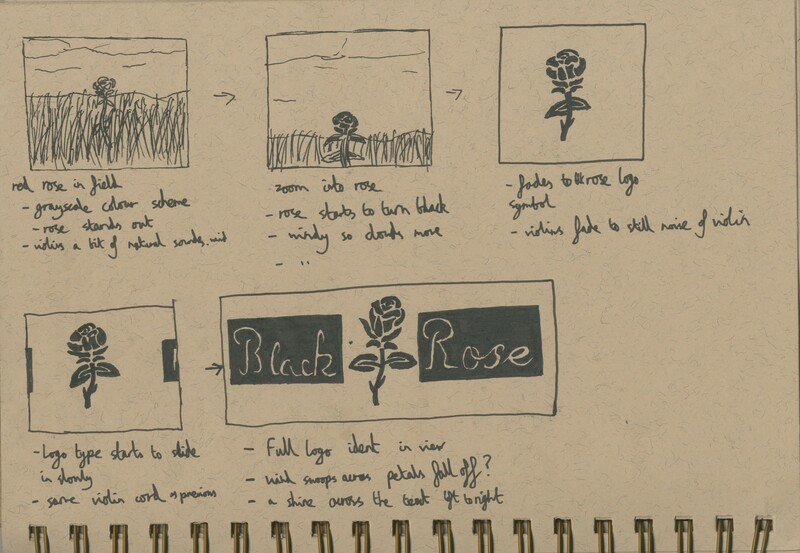 So the idea behind this storyboard for this was to have a rose in a field with clouds and the grass moving in the wind, the rose starts red and slowly dies and fades to black, the background fades out to just the rose, then the font slides in from the sides to have a final shine over the top then the petals fly off in a swoop towards the screen to cut. This could be a really professional looking ident with fine tuning and time taken onto it but this is not the one i will be focusing on it was just a developed idea i could come back to. For Rusty Tank my proceeding idea the idea behind it was to have a mountainous desert styled background which has a tank chugging along with smoke escaping from every gap, lots of bangs and breaks and then it stops. A time lapse of age occurs as the tank turns rusty being left for so long. Background fades ident text comes fades in and cut. I felt this was a solid idea that with my skill set in after affects i could have a real crack at. Now to take it into after affects. But first ill need a tank both normal and rusty so i had to detour into Photoshop to design myself the main character so to speak. Here is what i came up with a cartoon looking military tank with a slight shine to it from light and shadows to show a 3d effect on the tank. i did this purely by painting the tank using the brush in Photoshop on 100 hardness then alters opacity for shadows and layers extra detail such as shadows and light. The Rusty tank i used a rusted texture on the normal tank to place into the file then turned the opacity down, magic wand selected the surrounding around and background erased outside rust texture. I did also add some fliter>noise>dust and speckles as i did in the ident graphic but it did have as much effect so its hardly noticeable. Now im ready to head into after effects for the final ident production. Categories: Creative Futures | Tags: Adobe Photoshop, art, Design, Design Process, graphics, ideas., ident, Identities, Logo, PHASEgaming, progress, rusty tank, storyboard | Permalink. Creative Futures Mini Brief- Idents Part 2. As the next part of this brief is underway just to recap heres the last part of the brief, it involved the research on idents, semiotics and typography. This was to help us gain a good understanding on the next part of the brief which was unknown to us but if we had been given it striaght away we might have skipped important learning and research on the topic. Heres the links to the previous briefs blog posts- idents, semiotics and typography. The primary objective is to create ourselves an ident for a company in our field of work so for myself its games design. But before just jumping straight in and picking the first thing off the top of my head im going to formulate a design process to create about 50 different randomised names to gather all sorts of random rubbish or good names for a gaming company. I did this by creating 2 seperate lists of things, the first list included colours, metals, textures and precious stones. The second list included emotions, animals, geographical weather events, fruits, weapons and fantasy. From this i listed 40 for each to get a good range, hears some examples of what came up of the 50 random number generated results: chrome ocean, melted bullet, cracked fang, rusty tank, black rose and carbon shock for some good examples and then ninja mango, silver coconut, pink rage, diamond wok and soft bazooka which werent my favourites of the list. From that i particulary liked Rusty Tank, i imagined this as a possible shooter adventure game design styled studio with the ident storyboarded with a tank slowly breaking down with bits falling off to slowly fade into the Rusty tank logo where it would be part of the Text somehow. This was a choice aswell due to it being subtle it didnt sound too violent or too much of a mouthful it just felt like a studio name. And then Black Rose, i really liked this one it just sounded like a horror scary themed design studio that makes games like outlast so really dark, the ident storyboard idea behind it would be a grayscale sky and field with a red rose that slowly turns black to symbolise its died and then the logo comes in with the rose encorporated into it. This sounded really solid for a name especially for the theme i thought it could be linked to similar to Bad Robot’s ident but obviously Black Rose. With 2 names in mind and the nomenclature part of the brief tackled i moved onto typography. This would require me to research some typefaces i liked and see if they worked or didnt work with the style of ident i was trying to create, for example for a posh tea and cake dinner cafe you would want an elegant possibly script styled typeface to give that message across that you are elegant. That in mind i navigated to dafont.com which is a website full of many different types of typefaces this proved helpful for a wide range of different looks to the name. For Rusty Tank the typeface focus i was going for was a military styled type as a tank is obviously a military used vehicle. The first thing that came to mind was the stencil type which they had a section dedicated to different types of army styled types. In this list was 2 i felt fitted the ident quite well which was army rust and gunplay which were both similar but one was bold (gunplay) and the other had a effect added to it themed rusty (army rust). The stencil styled type was great for the message i was trying to create it is similar to the impact type which is seen as bold, aggresive and stand out on the page. 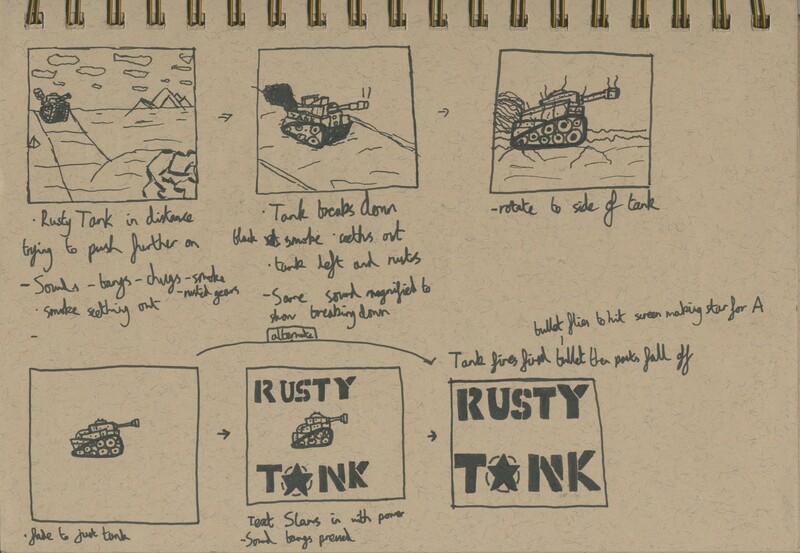 With the theme in mind and the choice i made to keep the tank themed with a army styled type i put pen to paper to design some different logos for Rusty Tank. I did a few designs in the stencil theme but i wanted to expand my design and try put a twist on these typefaces. One way i did this was to add a 3d element to the text giving the image that it was pieces of metal making the words welded and manufactured together, another way i tried to experiment with was a steampunk styled letters to symbolise the rusty mechanics of the tank and then a tank next to it with smoke seething out. For Black Rose i wanted a really elegant styled typeface a bit like letters were formed with quills on scripts as this would match the rose and its beauty despite the semiotic meaning behind the colour black of darkness or death it still keeps its elegance. Taking myself back to the dafont website i looked into first the medieval gothic styled type as i imagined this would be rounded with many flicks and overall beauty behind the type, not all gave this image across types like seagram or cloister black just didnt have the look i was thinking of and didnt really link to the rose. But saying that cardinal and kelmscott was getting there for the elegant look i was looking for so i tried them and they just didnt seem right. Moving away from medieval type i looked for another topic which i found in the list script with calligraphy. These were exaclty what i wanted for black rose it just fit really nicely with the rose. My favourites were Dragon is coming and Signarita Zhai, similar but different types of calligraphy. They looked like they matched the rose and when i encorporate the rose into the logo it seemed to fit seemlessly like it belonged there which gave me room the experiment on the placement of the rose. Once again i tried my own style on the calligraphy inverting the colours using a black ribbon around a central rose to nicely balance out the white and black of the logo giving the central focus to the rose. I was really pleased with my research into the typefaces for the topic as i found what i was looking for and created the meaning behind the type that i wanted to come across. This allowed me to design multiple different logos and see if i could create and think of something that really worked for the themes behind the idents. The next step was to create a storyboard for the ident to give the impression to what it would look like in a 3-5second animated promotional video which would convey the thos of my production company. Categories: Creative Futures | Tags: Design, Design Process, Identities, Logo, PHASEgaming, research, Typography | Permalink. For this session we had to go into a bit of research in the field of companies logos, identities and brands. For this I would mix a possible range of different versions and maybe different fields so games mixed with TV etc. A useful video if I can find it would be a change of a companies identity over the years. Here is a really interesting video of the transition of logos through the times with one of the most recognisable brands out there with coca cola and its co existence with Pepsi. The video highlights the slight changes with annotations around the logo like the coco cola wave behind the word added in 1985 or Pepsi’s added colour of blue in 1950. Both really good examples of the evolution of logos in companies. For a games related logo I had to put my personal favourite due to many hours of crash bandicoot played of Naughty Dog and its ident on the crash bandicoot game, i just love the animation of it with the fluctuating paw flying into the logo and the dog house sliding in from the side to wobble its just really nicely made with the sound effects. This logo has stayed very similar over the years as naughty dog studios even with games like uncharted and the last of us being their area of design lately away from previous years of cartoon styled crash bandicoot. Here’s a nice image of that to show the little change only alterations through the years of different games have happened e.g. 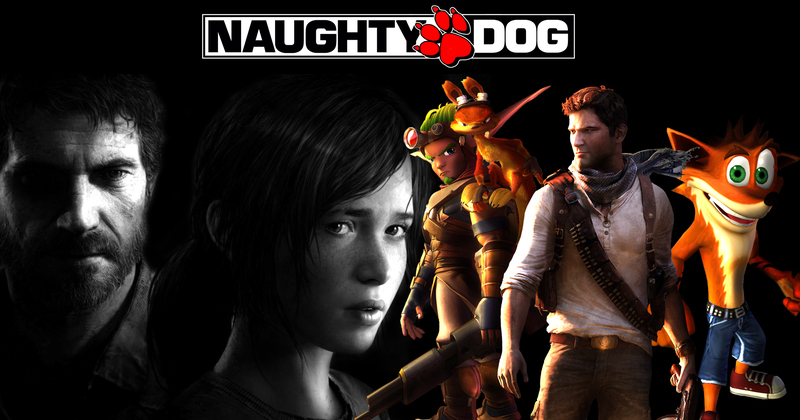 the alternating style of naughty and dog swapping styles of black text white background and outline additions. And this video shows a contrast from starting off with humorous style of ident introduction to a game until later on when they moved into more professional smooth idents. my favourite still has to be the original crash bandicoot but I do like the new shiny steel finish to the logo after a block built 3d paw. I tried to find idents that may have influenced future companies to imitate the same style slighty. one that jumps out for me is Ubisoft’s introduction ident of more recent years not the original which always reminds me of doctor who with a intel styled tune behind it. obviously minus the tardis and the names but the portal time travel style is very similar I think. So there is a little research on Logos, Identities and Brands which gives a good understanding on what they might be and if tasked with enough research and inspiration I believe I could create my own identity, logo or brand. Actually I have begun that process already. and then my logo process. Also for our group project of Alaskan secret I designed the logo for that here. Categories: Creative Futures, Games Design: Introduction, Research | Tags: Brand, Creative Futures, Design, Identities, Logo, PHASEgaming, research | Permalink.